Having received a BFA from the School of the Museum of Fine Arts in Boston and a Masters in Architecture from Virginia Polytechnic Institute, I usually say that I’m a motherarchitectweaver. It’s hard to choke out that I’m an artist. I’ve been weaving for over 30 years since learning the fundamentals in Finland (in Finish!) while my husband was on scholarship. For many years, I’ve been fascinated by shrinking or collapsing yarns or fabrics. Over the past decade, I’ve been intrigued by a method of felting that Polly Sterling has called “Nuno” felt. The word “nuno” comes from the Japanese word for “new”. Wool fibers have barbs or scales running up a strand of wool. When the wool fibers are processed with agitation, water and detergent (a change of PH), they open up and then lock together, forming a new structure, forming felt. In May of 2002, I moved my three looms out of my home to a studio newly developed in the former Damart Factory in the neighboring town of Rollinsford, NH. In the Fall, I experimented with felting after being asked to submit a piece for the buildings first show- Day of the Dead. I made a Shroud of Felt with the intention to make it as light as possible without falling apart. 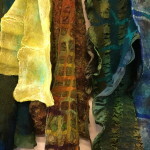 I’m interested in ‘painting’ or layering the wool fibers, seeing how the wool colors blend when felted and adding the extra dimension of handpainted silk fabrics and other fibers to the felt. Process drives my work. The felting process gives me time to think as I work with my hands. I’m always imagining the next piece…Could I do this? What if I tried that?